I recently gave our family room a makeover (you can see all the details on that makeover HERE). 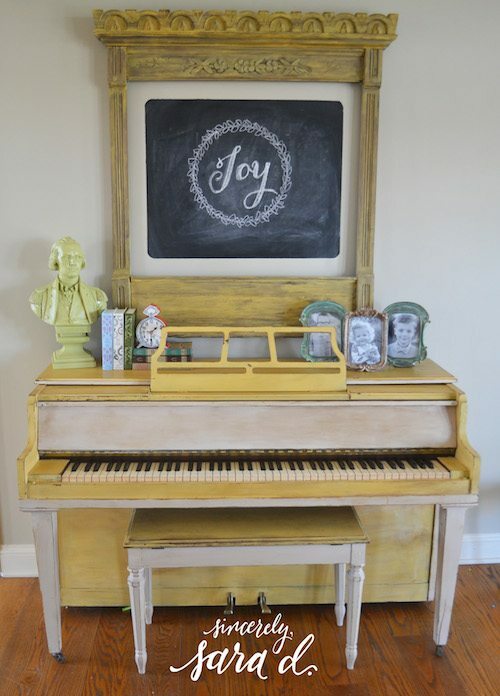 After that makeover was completed, I realized our yellow painted piano didn’t really work in the newly design space. 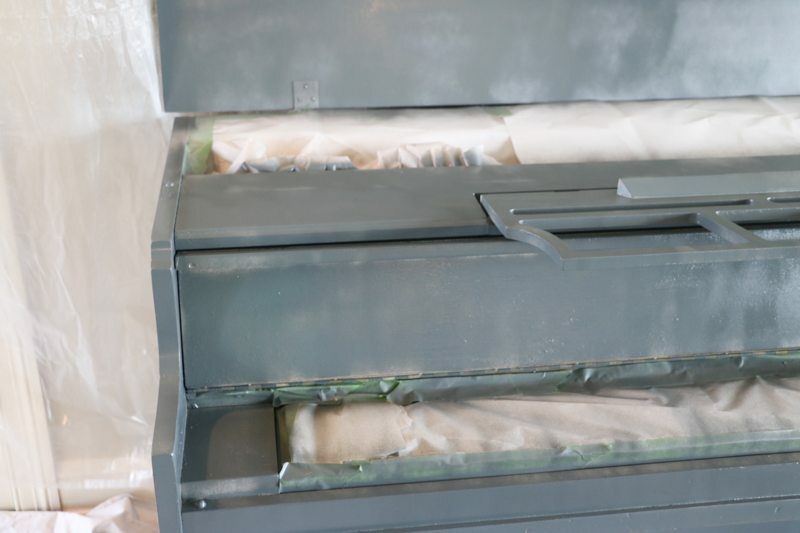 It was previously painted with milk paint and chalk paint (you can see that makeover HERE). Style preferences change over time, and I just wasn’t loving the more shabby chic look of the piano any more. 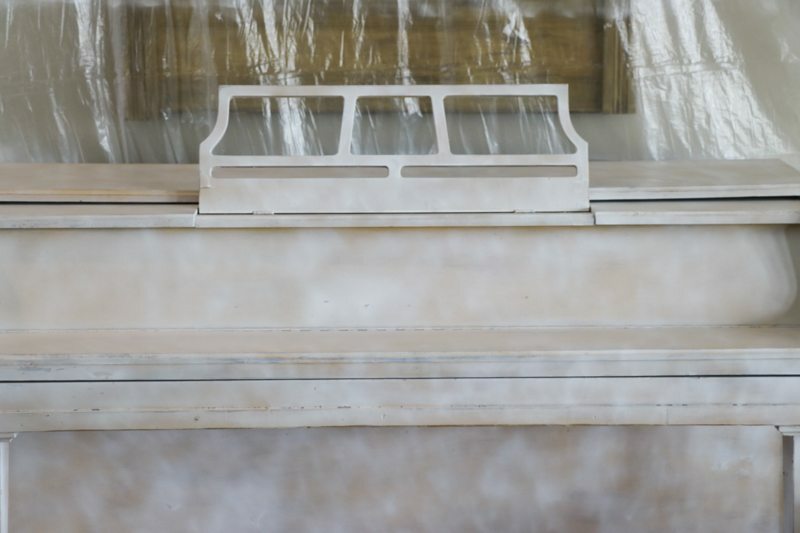 Here’s a photo of the original image of the piano – before it was painted yellow. We loved (and the boys played) the yellow piano for the past four years. However, I was ready to give her a more sophisticated makeover. 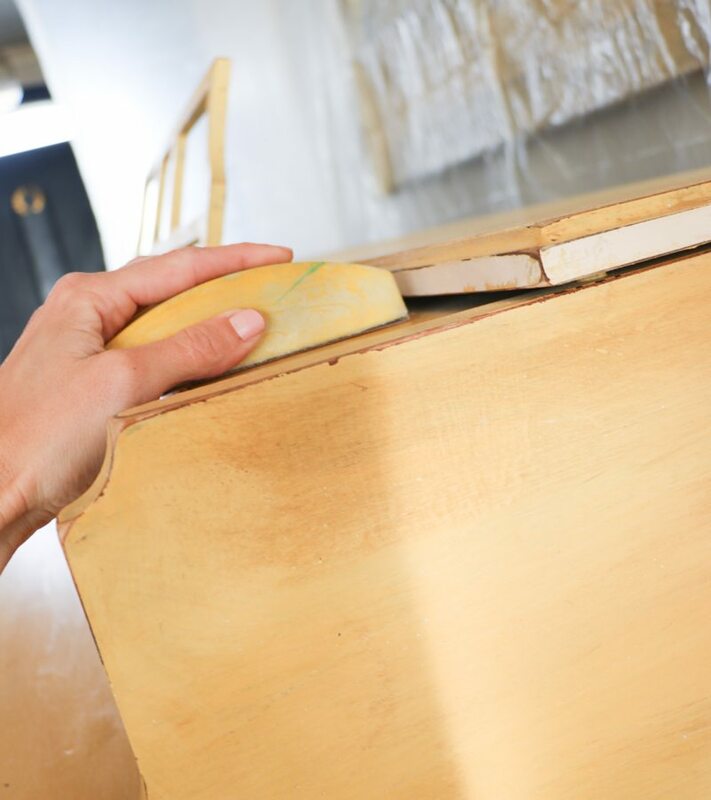 I began by sanding the piano with a fine sandpaper. 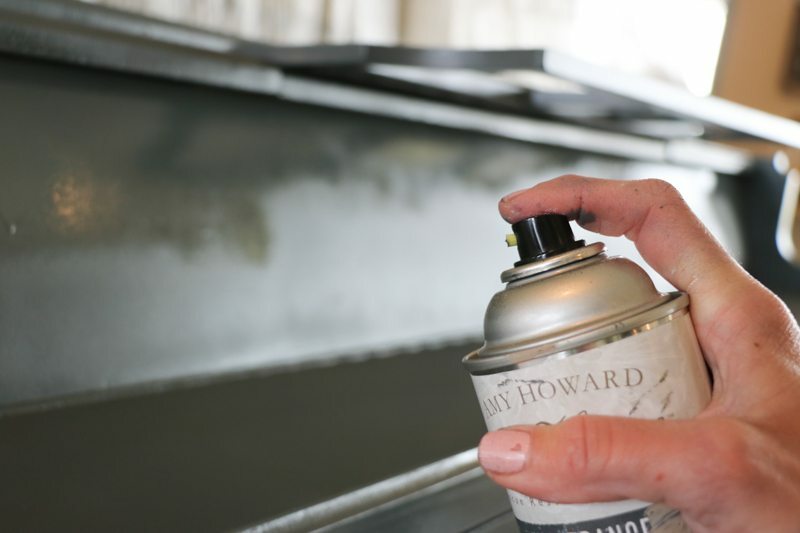 I had previously used a wax on the piano, and I have found that wax resists paint. After the sanding was done, I wiped down the piano with a cleaner. 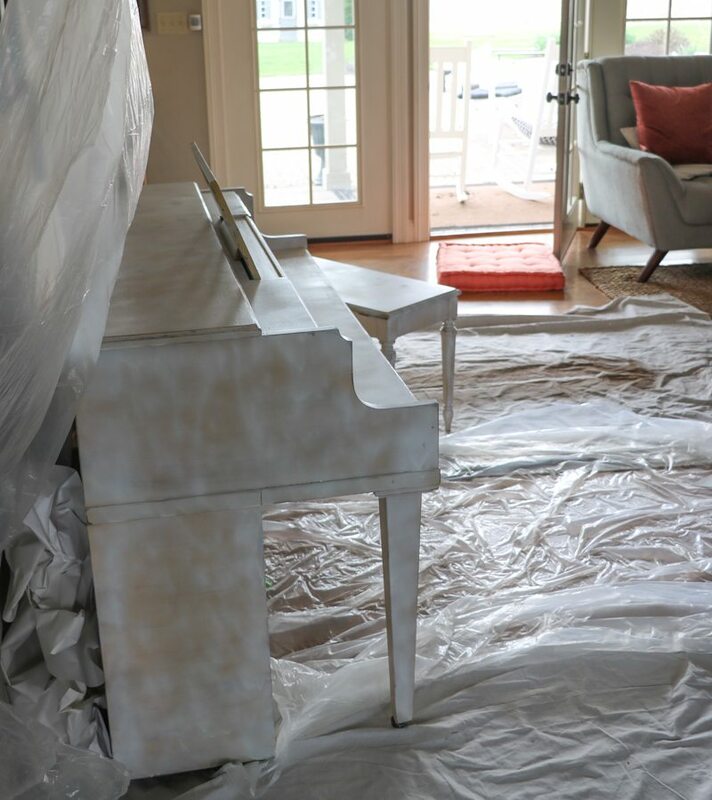 I don’t recommend using spray paint inside, but I definitely didn’t want to move the piano out to the garage to paint. It was just too much work. Instead I opened windows and doors for ventilation and covered everything in my home. 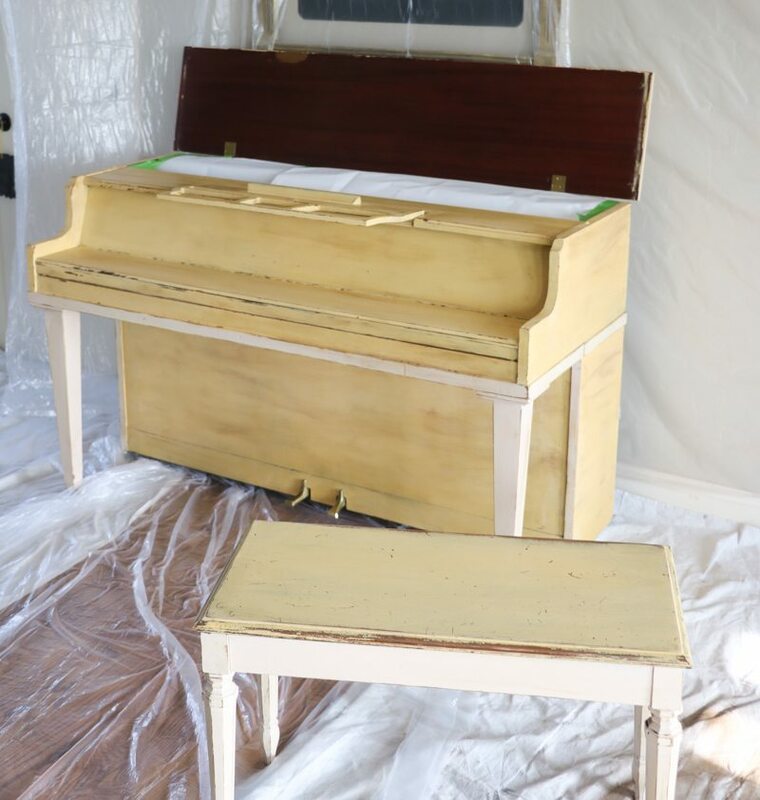 I taped off everything I didn’t want painted on the piano. 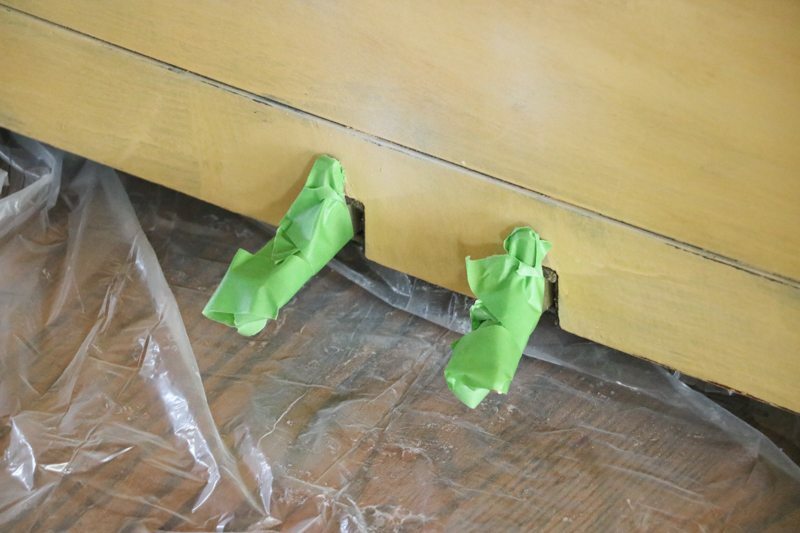 After everything was taped down, I added Amy Howard’s at Home Furniture Lacquer Primer. I used three cans for the piano. 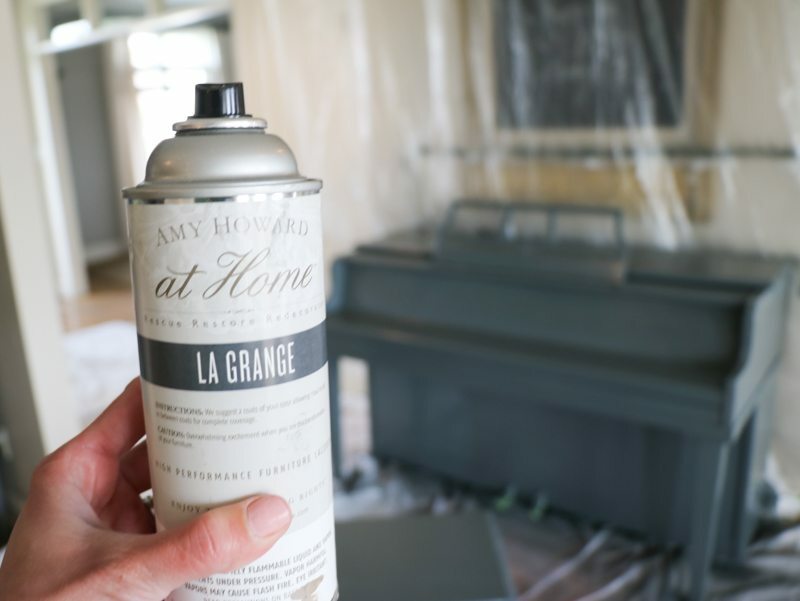 After the primer wax completely dry, I began with Amy Howard at Home’s Furniture Lacquer in La Grange. I painted light coats and allowed them to dry in-between. 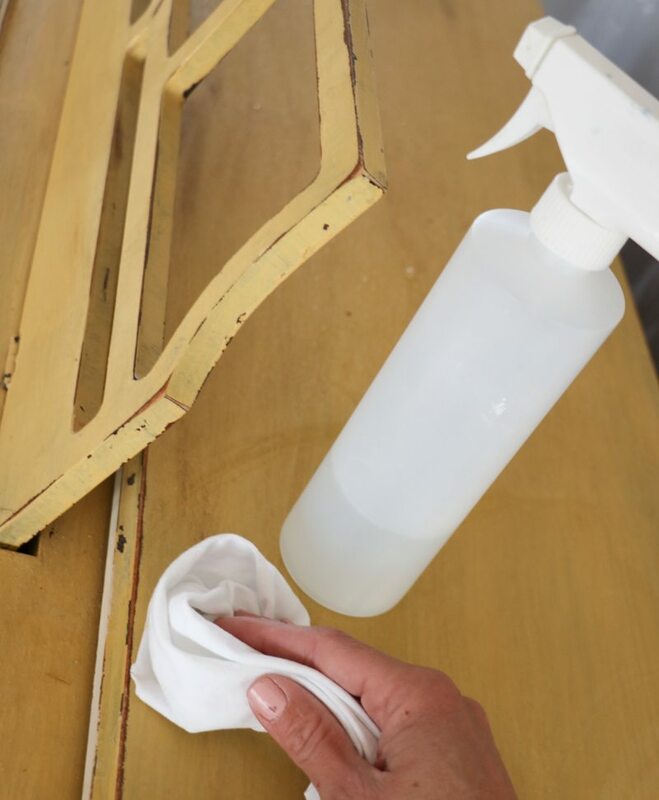 Once dry, I sanded lightly and use a lint-free cloth in-between coats. Lacquer is tricky, but it does provide a gorgeous finish. You have to move slowly and carefully (but not too slowly that it drips). 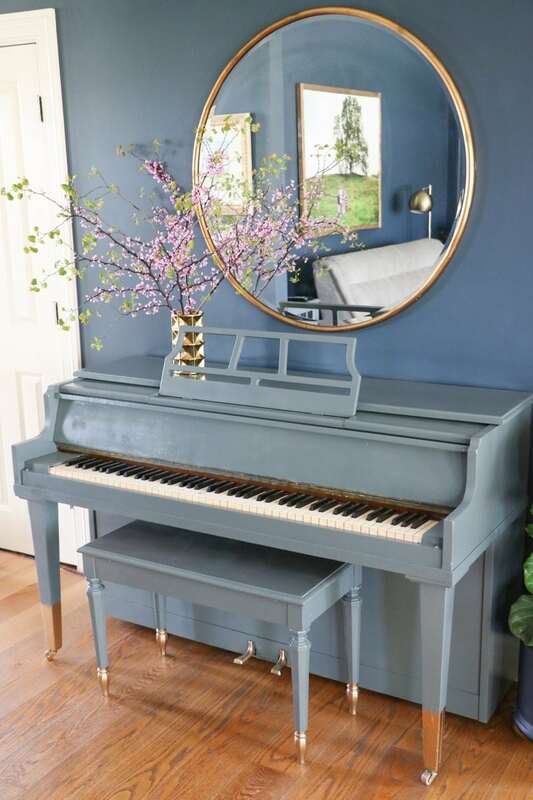 It took patience and time (and around 4 cans), but I had a gorgeous new piano in one day. I had gold spray paint on hand, so I used it to add gold-dipped legs and brighten the pedals. 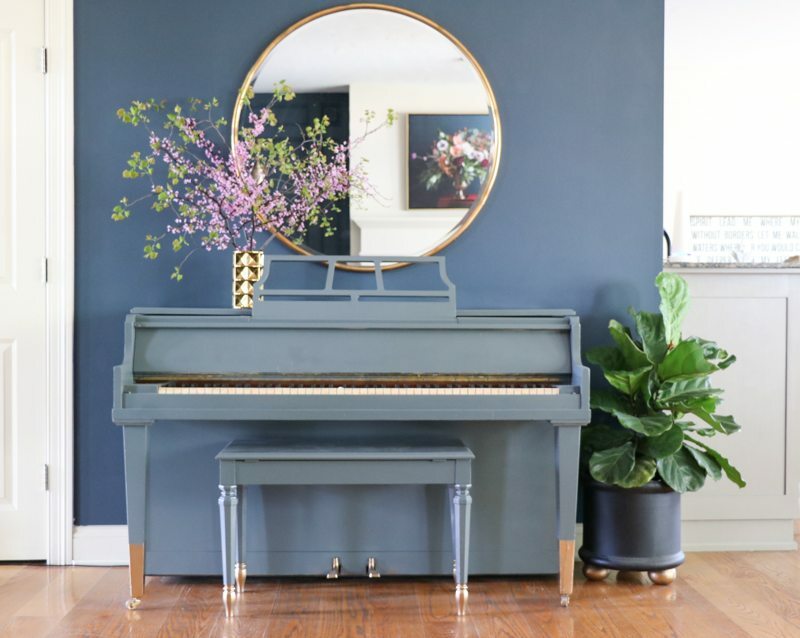 The piano has a sophisticated new look that fits perfectly in my newly designed family room! *This post is a sponsored post by Amy Howard at Home and contains affiliate links. I take pride in reviewing only products that fit my brand and will be beneficial to my readers. And while this post is sponsored, all the opinions are my own. It looks fabulous. Great job. Simply stunning! 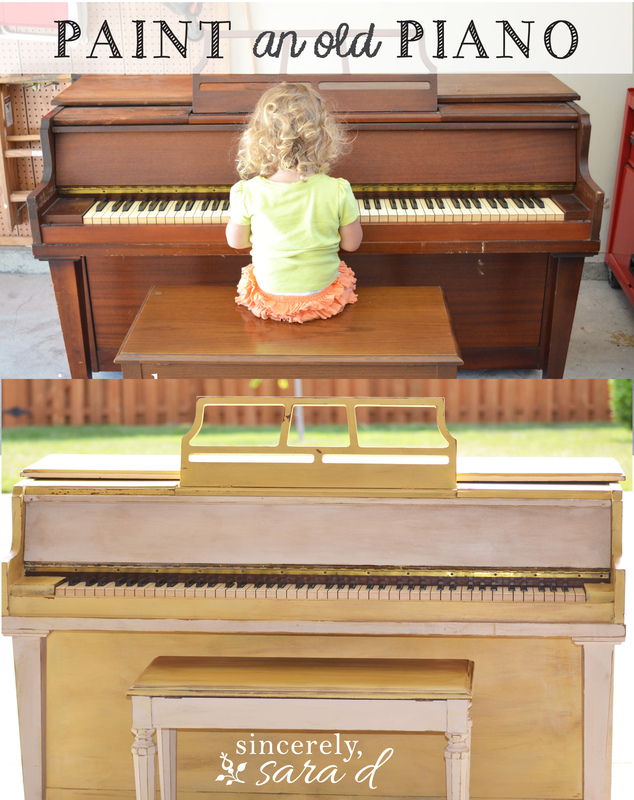 Once my daughters are old enough to practice piano I want to do something like this! I love the color too! Thank you Andrea! Have a great rest of your week. 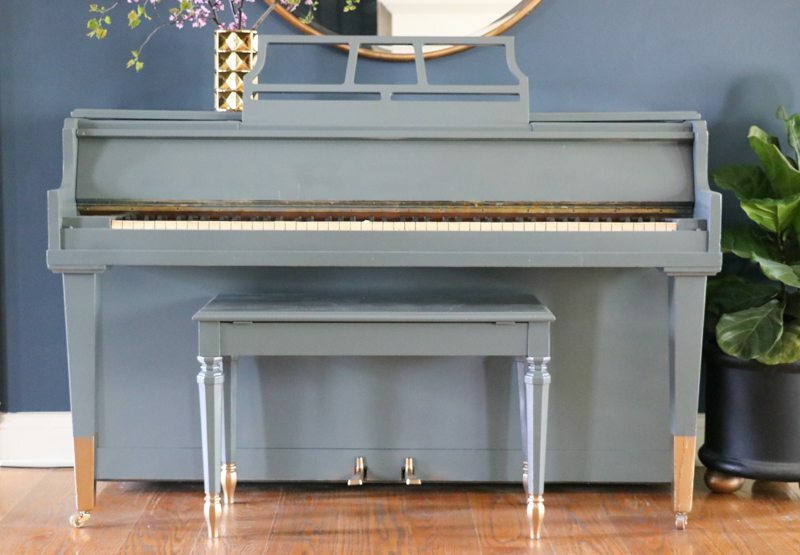 The piano looks amazing! I love your mirror! Where did you get it? It’s beautiful. I have an old metal and glass horizontal cabinet I have been wanting to update. This may be the perfect paint application. 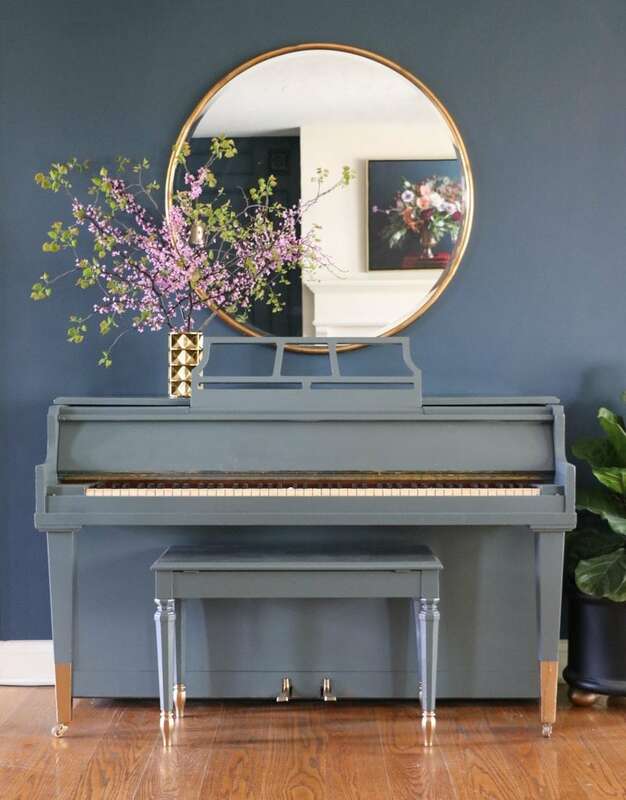 Can you tell me the name of the wall color behind the piano? Love that too!! Thanks for your great posts. Thanks Jill! 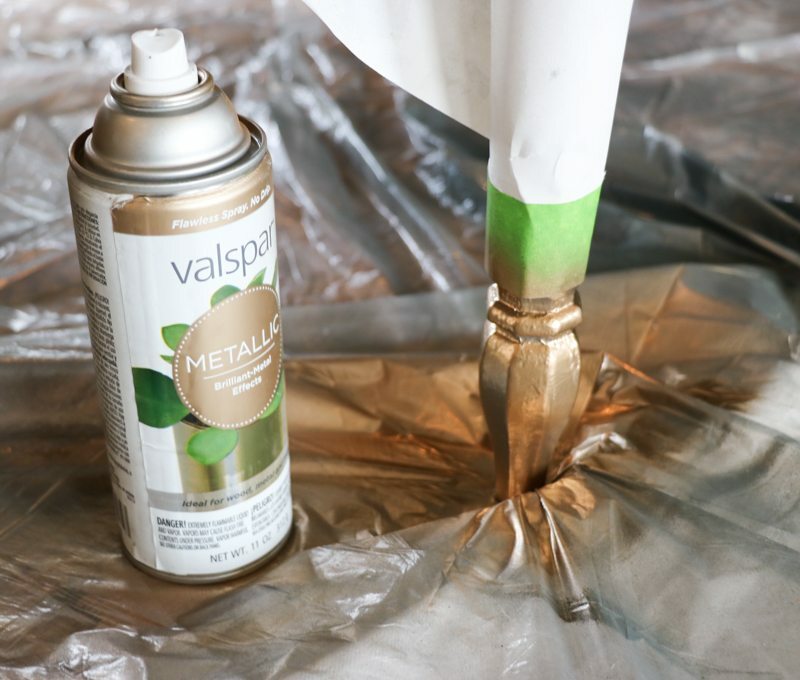 I used Valspar’s Night View on the walls and love it! Good luck on your painting project! Beautiful! Are the flowers real? If not do you mind sharing where you got them? Such a pretty space!! Unfortunately they were real – it’s from a tree that blooms briefly every spring. I wish they were fake! It’s not electric, and it was a $50 find. It’s not in great shape, but it works for practice! 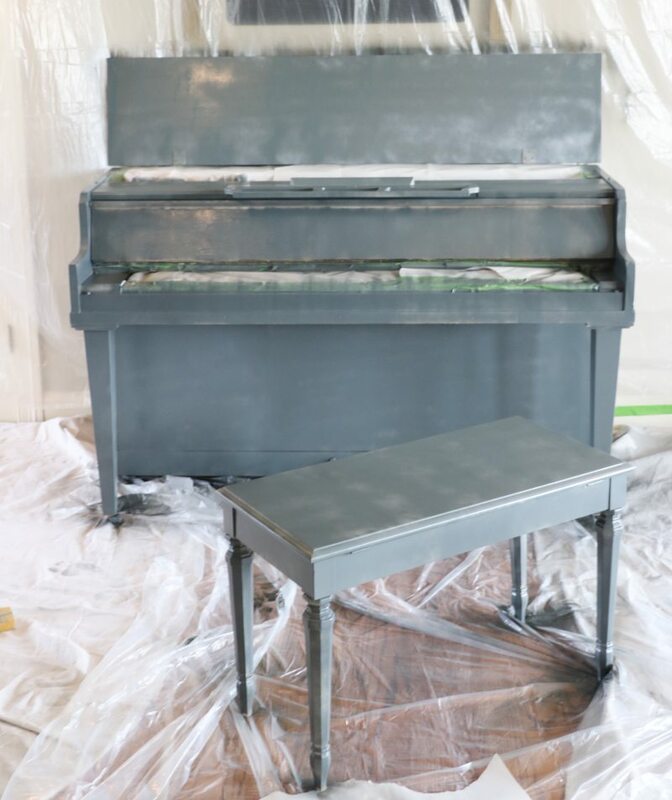 Wow, I have always wanted to paint our old piano. Your tutorial looks easy, so I may give it a try. Our piano is old, yellowish but has a great shape. I hope I can make it look great like yours.